This article is about R.O.B. 's Final Smash in Brawl. For his Final Smash in SSB4, see Super Diffusion Beam. The Diffusion Beam (拡散ロボビーム, Diffusion Robo Beam) is R.O.B. 's Final Smash in Super Smash Bros. Brawl. R.O.B. gains invincibility and shoots medium ranged whirling lasers out of his eyes (with almost no knockback), followed by some hard-hitting short lasers (with tremendous knockback). Similar to the Superspicy Curry. R.O.B. can move freely during the Final Smash. Being in the general area in front of R.O.B. causes damage that rises at a 2% damage rate and as long as R.O.B. is in front of an enemy, he will continue doing damage. With the laser having good reach in front of R.O.B, in combination with the hitbox being continuous, the attack lasting a considerably long time for a Final Smash, and R.O.B. being free to move and pursue his opponents, it is often considered one of the most difficult Final Smashes to evade. 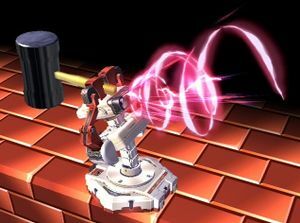 R.O.B's ability to move during it results in some chaos as he chases opponents around the stage, trying to catch them in the deadly vortex of his eye beams. He can also use his entire moveset (excluding Robo Beam) during the Final Smash, and can even use items and taunts without affecting its hitboxes. Diffusion Beam trophy in Brawl. For unclarified reasons, this Final Smash was not described on the Smash Bros. DOJO! !, making this the only Final Smash that was never covered by the DOJO!!. R.O.B. is the only character besides Jigglypuff who can benefit from the Bridge of Eldin Final Smash glitch, giving him a never ending Diffusion Beam (Jigglypuff's makes it remain huge). Even though R.O.B. can grab and use items during this state, he cannot use items that activate on contact (i.e. Starman). Because the lasers are emitted from R.O.B. 's eyes, they point in whichever direction his head is facing. This makes it possible to hit crouching enemies by also crouching, or hitting enemies above by using his side taunt (which makes him look upwards). The only Final Smashes (and quite possibly, the only attacks) that can damage R.O.B. during his Final Smash are Luigi's Negative Zone and Jigglypuff's Puff Up (during the shrinking part). The two Final Smashes cannot be used at the same time without exploiting glitches or hacking. This page was last edited on March 22, 2019, at 19:15.